Based on the complaints received from various students, ELTF finds that the banks do not classify NPA properly and unnecessarily blame the students. We have found out 7 important reasons for inflated NPA by banks. 1. Inhuman attitude of the bank officials. Not understanding the financial status or earning capacity of the student. Though IBA stipulates 10 to 15 years of flexible and telescopic repayment (lower EMI at the beginning and gradual increase of EMI in the later years), most of the branch managers fix huge EMI for 5 years. This burdens the students. EMI is fixed more than the income of the student. 2. Reluctance of bank managers and regional managers to re schedule the EMI, even in genuine cases. 3. Wrong classification of education loans. If the education loans are properly classified, nearly 75% of the present NPA will become good assets. Banks purposely show increased NPA to avoid education loans. They prefer huge corporate loans, even if they become NPA, for 'obvious' reasons. 4. Right from the day 1 of a student entering the bank premises seeking education loan, he is being harassed and asked to run pillar to post. The students get frustrated and develop enmity with the bank. Managers do not create awareness of the bank rules among the students. In many cases, we found managers themselves do not have good knowledge. 5. Lack of good relationship between the branch officials and the borrowing students. That is why we always suggest that a get together of all the borrowing students once in a year to be conducted by the branches or regions, so that the students develop loyalty. Unfortunately, no bank is willing to accept our suggestion. 6. Lack of proper interest subsidy management by the branches. Though 100% subsidy is available for students, the branches do not claim the correct subsidy in time. Even the subsidy element is taken into account as NPA. Unpaid subsidy is the default of the Government. For example, a person who avails a loan of Rs.1,00,000/- at an interest rate of 12% pa, disbursable for 4 years @ Rs.25,000/- per annum is eligible for an interest subsidy of Rs.42,000/- from the Government, if he is eligible. Unfortunately, in most of the cases, the student gets only around 20%. If he gets a subsidy of Rs.10,000/-, the bank forces the student to pay the balance amount of interest Rs.32,000/- (amount not paid by the Government). When the student commits 3 months default, the bank classifies the entire loan as NPA, which includes the sum of Rs.32,000/- not paid by the Government. It is the NPA of the Government technically and not that of the student. How the student can be blamed? 7. Individual banks and Indian Banks Association do not take interest in creating awareness about education loan, interest subsidy, repayment etc. Even recently, when Ministry of HRD extended the interest subsidy due date for SC/ST students, neither the banks or IBA took any initiative to pubclicise the extension date. ELTF issued press note and publicised throughout India for the benefit of SC/ST students. 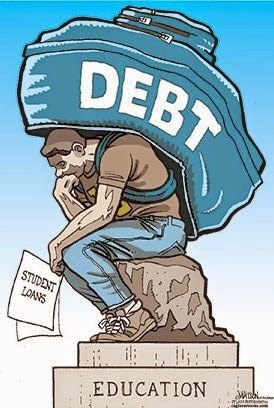 The insensitivity of the Banks and the Indian Banks Association in implementing the Education Loan Scheme is the main reason for all the problems faced by the students.